One hundred and twenty police officers have taken part in a major operation against alleged drug dealers in the Ballymena area. Fourteen people were arrested after police carried out early morning raids in Ballee, Ballymena, as well as in Belfast and County Tyrone. A quantity of class A and class C drugs were seized along with a sum of cash. Police met in Antrim at 0600 BST on Thursday and travelled to 10 addresses in the Ballymena area. They also targeted one address in Belfast and an address in Sion Mills, County Tyrone. Twelve men and two women are in custody in connection with the operation. Commanding officer Mark Dennison from Ballymena CID said the operation had been planned over a long period of time and involved months of evidence gathering against individuals named in arrest warrants. 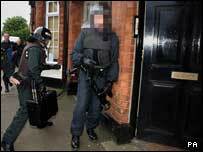 Within the last three years, there have been 60 convictions for supplying class A drugs in the Ballymena area. "Our job is to catch more of them, convict more of them and to treat more of them," he said. "It should be noted that Ballymena police have convicted almost 60 people in the last three years for supply of Class A drugs. "As a result of the arrests today, that figure could rise significantly. "The operation today is not only about enforcement. Ballymena PSNI work with a range of statutory and voluntary agencies in the district." # posted by SAOIRSE32 : 6:26 p.m.